Holiday season was busy with visiting relatives and good waves. Now its back to building boards. Here’s a 9-6 Nova Pintail getting fin boxes. 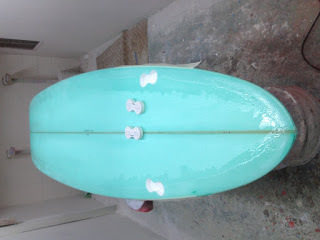 Its has a sweet Ice Green resin tint on bottom and rails, with a green pinline. Also at the glasser’s is a 9-6 Nova for Rick and a 9-0 Nova Benjamin.